The Emerald Coast Tourist Card will soon be available for the 4.5 million visitors who travel along our 100-mile stretch of paradise each year. 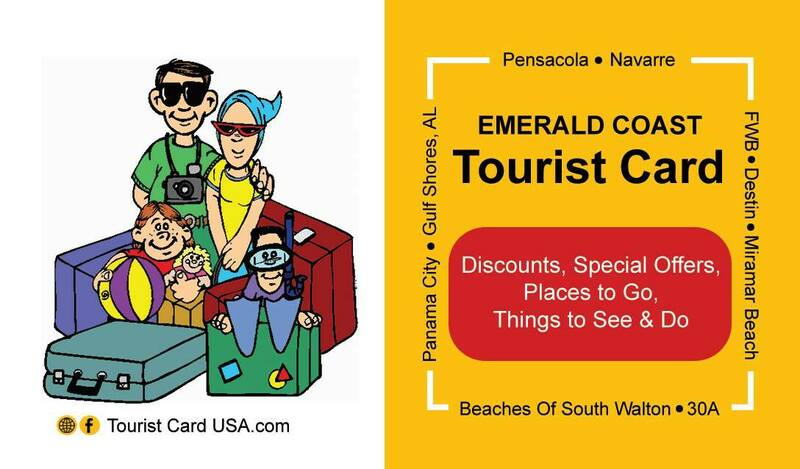 The first of its kind, the Official Emerald Coast Tourist Card can be purchased online or from participating Retailers along the Emerald Coast; from Gulf Shores, Alabama to Panama City Beach and all the towns in between. 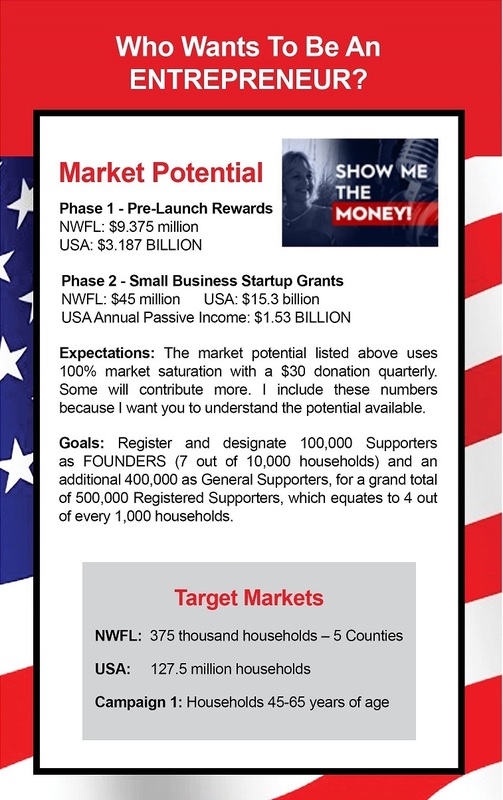 Side one will promote tourism related business owners and the back will promote shopping "local," which could benefit all business owners throughout the region by the additional exposure. The plastic discount card and keytag option will retail for $10 each and will be valid from March 1st to February 28th each year. Visitors can log on to the website or social media sites to view special deals and promotions from participating retailers throughout their visit. 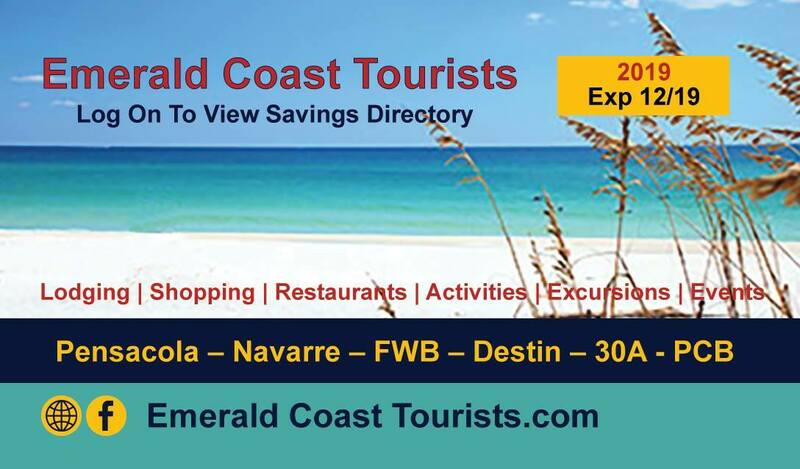 Card holders simply show their Emerald Coast Tourist Card at the checkout or promo codes online to receive their discounts. 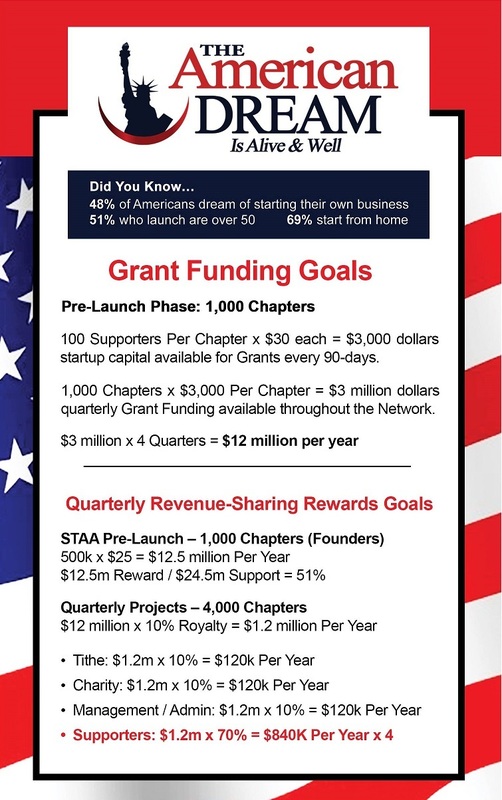 10% Revenue-Sharing Royalty Rewards are available for Business Owners who join our team prior to April 30th. 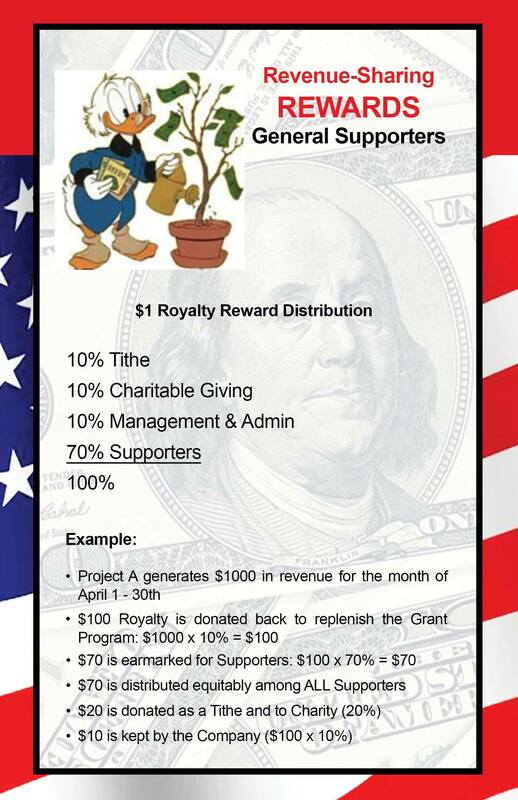 Every time a card is sold, a 10% royalty will be split equitably among all supporters on the 10th of the following month. * Advertise your special deals, offer coupons, videos and calendar of events. * Limited Space Available: Advertise your business on the back of our membership rack card and brochures. * Affordable, Great Value For Our Tourists & Excellent Profit Margins for YOU! Sell our cards to your customers! * Discount Card Retailer: Purchase our tourist cards at wholesale, sell at retail. 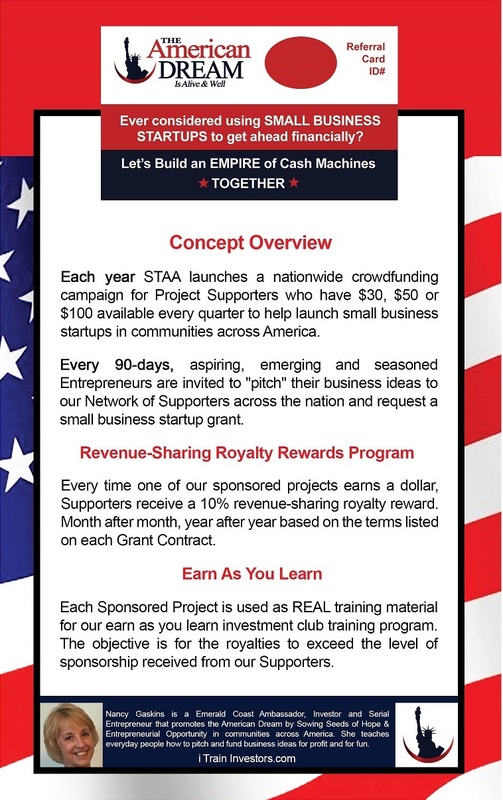 * Become a Supporter & every time one of our cards are sold region-wide, YOU will receive a revenue-sharing royalty reward. Rewards are paid on the 10th of each month. 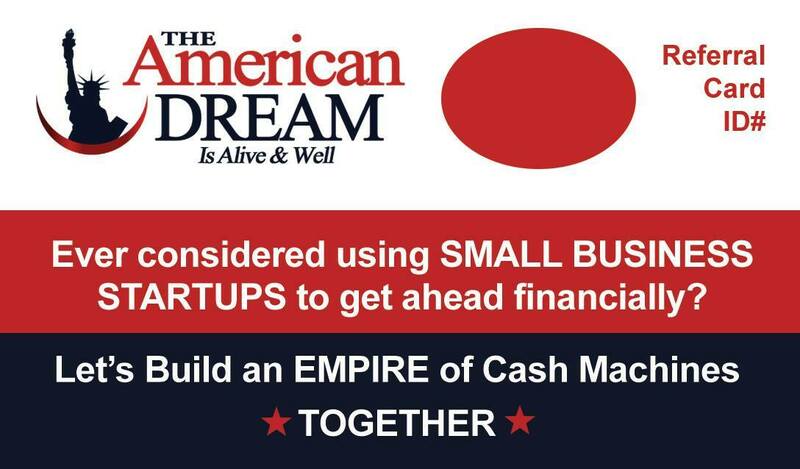 *does not include the economic impact for our local businesses and communities. Bedrooms By The Beach is Coming! Imagine ONE WEBSITE that every family across America would recognize as the undisputed #1 "goto" source to locate and book BEACH getaway destinations and activities for their families each year. How many of YOU would like to get in on a piece of that action? 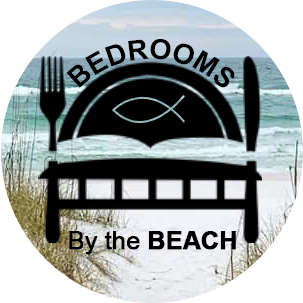 Bedrooms By The Beach is a NEW online platform for budget conscious families to locate and book affordable beach getaways and activities along the Emerald Coast of Northwest Florida. Join us in our efforts to build, host and promote a Network of 1,000 beach vacation activities and affordable lodging options; i.e. Guest Rooms, RVs, Condos and Homes along the Emerald Coast. ONE website where families can go to plan their entire beach getaway; i.e. book a guest stay, fishing trip, pirate cruise, dolphin cruise, boat/jetski/paddle board rental, have access to a community calendar to see what's going on in the local community during their stay and preview all the exciting things available to see, do and experience along the Emerald Coast. ONE website where BEACH vacation property managers, home owners and hosts can affordably list their properties. ONE website where businesses that support the Beach Getaway lifestyle can affordably list their products and services. This project is being funded by a Crowdfunding Campaign. You are invited to join us in our Campaign. 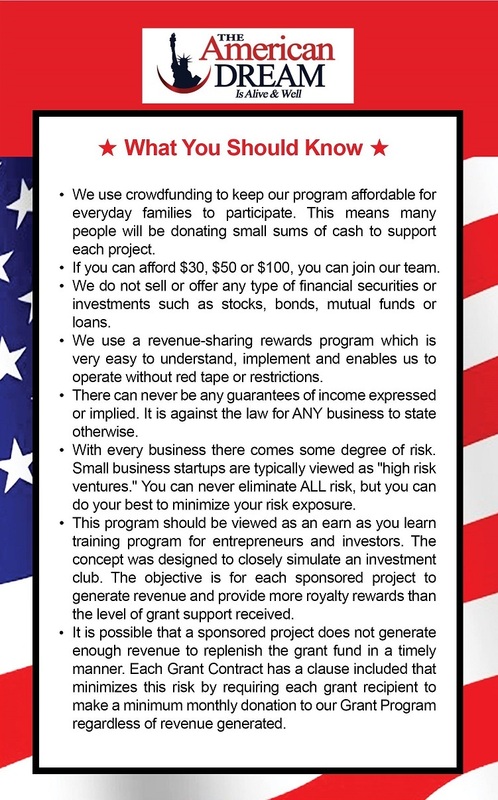 We need your help to bring this NEW program to communities across America. REWARDS: As a thank you for supporting this campaign, every time this project generates a dollar, every Supporter will get a piece of the action; month after month, year after year! 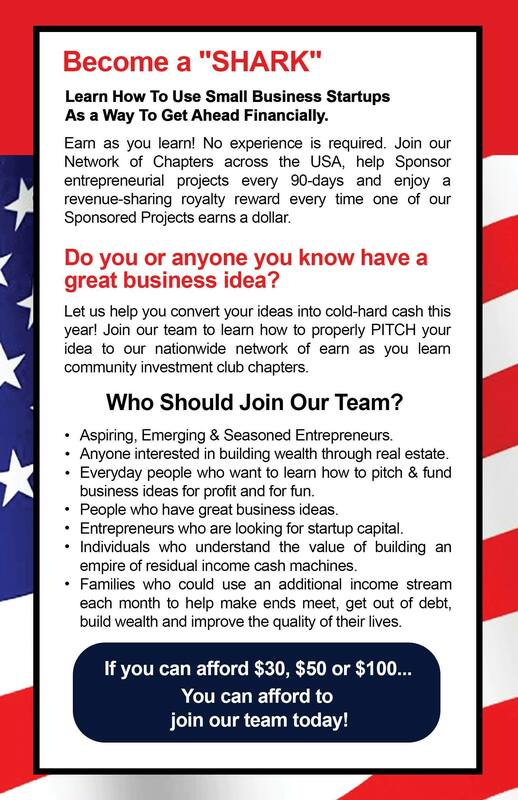 COOP Advertising Campaign has begun and we need your help! 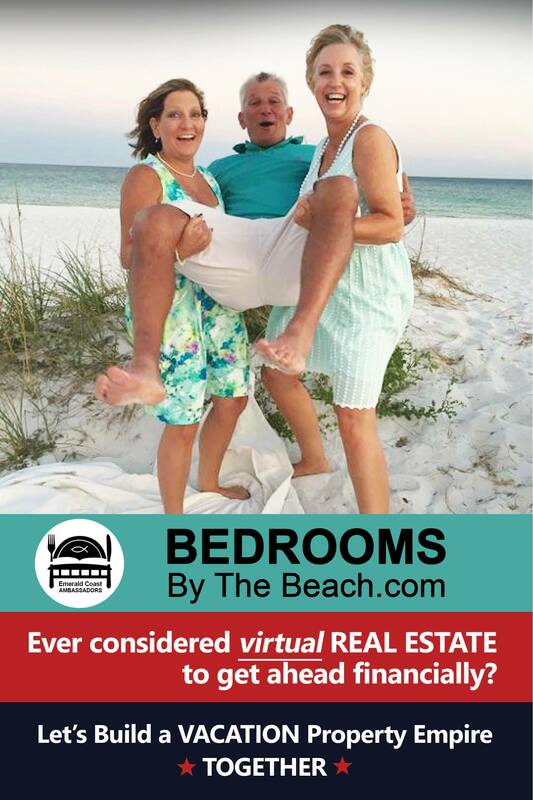 Local, regional and national targeted coop advertising campaign promoting the 100-mile stretch of sugar white sand and emerald green water affectionately dubbed "the Emerald Coast." Help us introduce and promote this program at the local, regional and national level. 4. Vintage RV: Gulf Stream Vintage Cruiser, Forrest River RPod or Winnebago MiniDrop or similar teardrop vintage RVs. 5. Lease / Purchase Condos, Townhomes or Homes to add to our vacation property inventory for Guest Privileges. The Bedrooms By The Beach Supporter Registration Form is located on our Crowdfunding Campaign facebook page. Industry leader Airbnb is an online world-wide MEGA marketplace and hospitality service. Members can use the service to arrange or offer lodging, primarily homestays or tourism experiences. Online platforms like Airbnb have turned the hotel, travel & tourism industry upside down. 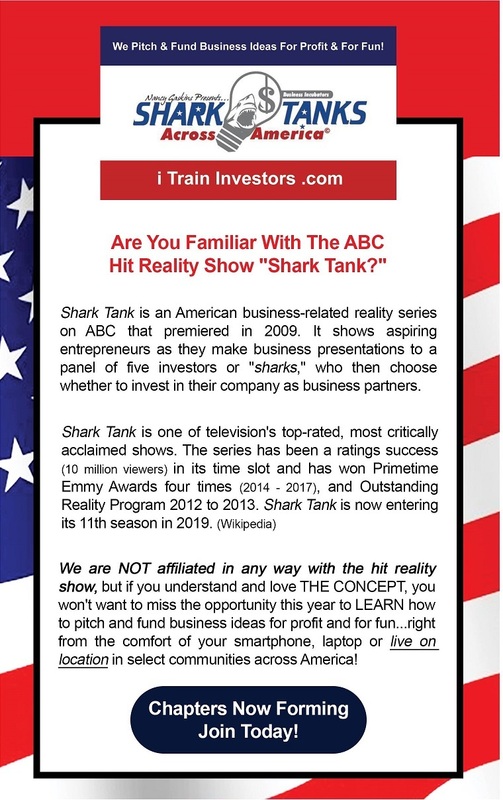 They are generating millions of dollars each year and are building BILLION dollar empires in the process. There's a reason Airbnb spent $23.5 million dollars in advertising in the USA. The company boasts nearly 5 million lodging options across 81K cities in the world and is estimated to be worth at least $38 BILLION in 2018. The most common reason cited by users of these sites as to "WHY" they use online platforms like Airbnb and Home Away is affordability. As of April 4, 2019 AirDNA reported over 20,000 vacation property listings in Pensacola, Navarre, FWB, Destin and Panama City. This number does not include how many reservations were already booked; this number represents the number of active listings available on that particular day. This clearly demonstrates that LOCALS along the Emerald Coast are indeed using online hosting platforms to list their vacation properties, homes, tiny homes, cottages, boats and RVs for guest use. Are these listings getting booked? Does this type of service work? Are customers happy using this type of service? Take a look at the reviews for each Host listed and you will see the answer is a resounding "YES." Many Hosts have been participating so long they now enjoy repeat business. Anyone can view the listings online, check out the reviews and see just how popular these guest rooms have become over the past few years. Visit (www.airbnb.com) to get a feel for what our new website will look and feel like. Will the Marketplace Support Another Option? The current platforms available are typically niched out according to what TYPES of properties; guest rooms, rvs, boats, etcetera and have listings available all over the world. What I've NOT found is an online business that specializes in specific targeted areas and regions; i.e. the BEACH. We do find property management companies who are advertising and promoting their own beach vacation properties, but there is no clear leader in this niche market that specializes in beach vacation properties only. and I'm willing to REWARD you handsomely for that help! 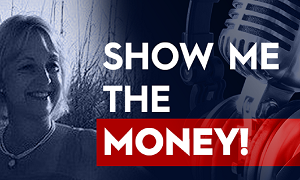 You can join our team as a guest, referral partner, host site or general supporter and enjoy revenue-sharing royalty rewards on a monthly basis, month after month, year after year! 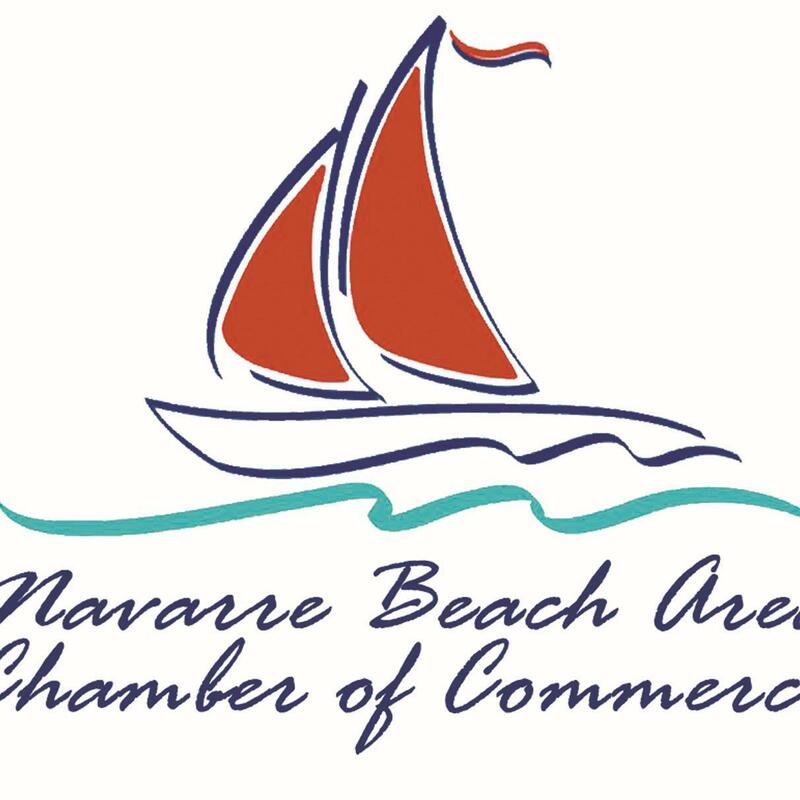 We begin in Navarre, Pensacola, Fort Walton Beach and Destin, with plans to expand our reach to include the entire 100-mile stretch from Gulf Shore, AL to Panama City Beach, Florida. 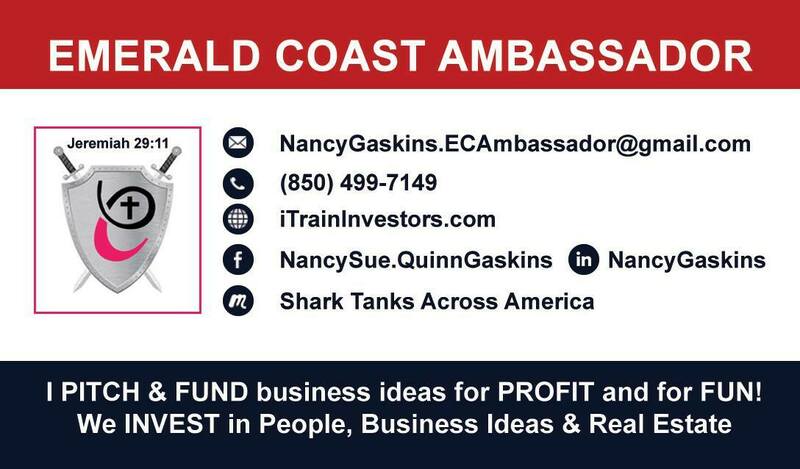 Once we've successfully launched the Emerald Coast, we will expand to include other top beach getaway locations throughout the USA. 1. Budget conscious families who are looking for affordable beach getaway options. 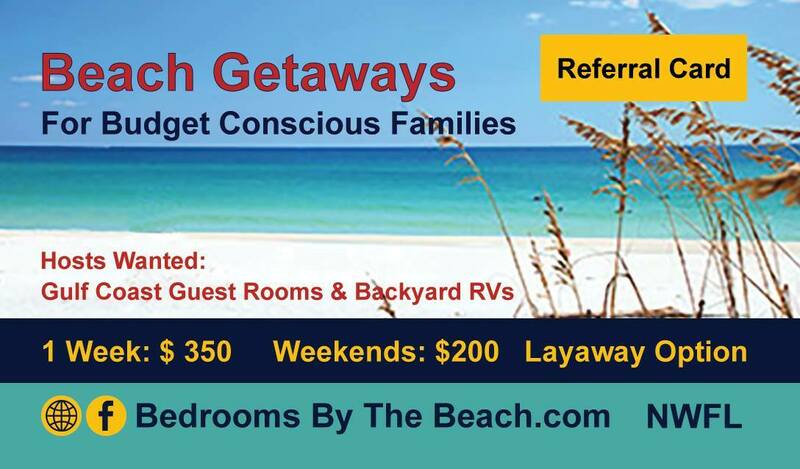 Our Network will offer Guest Rooms and backyard RVs at amazing price points. To help keep expenses down and minimize the workload on our Site Hosts we only offer weekend or 1-week options. Other options will become available as we expand our Network Providers. 2. Locals: To encourage frequent visits throughout the year, we will also be targeting families who live within a 3-hour driving radius and offering them great deals on weekend getaways. 3. 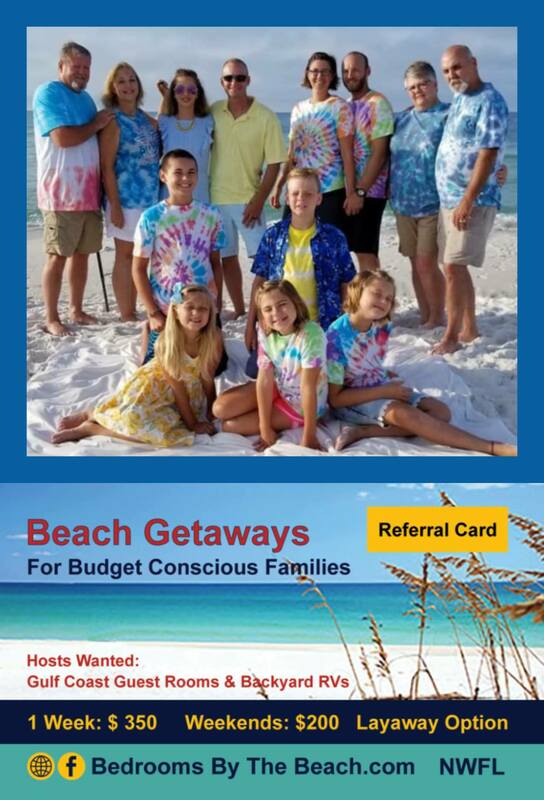 Everyday individuals and families seeking Emerald Coast beach getaways. This project is being funded by a crowdfunding campaign. 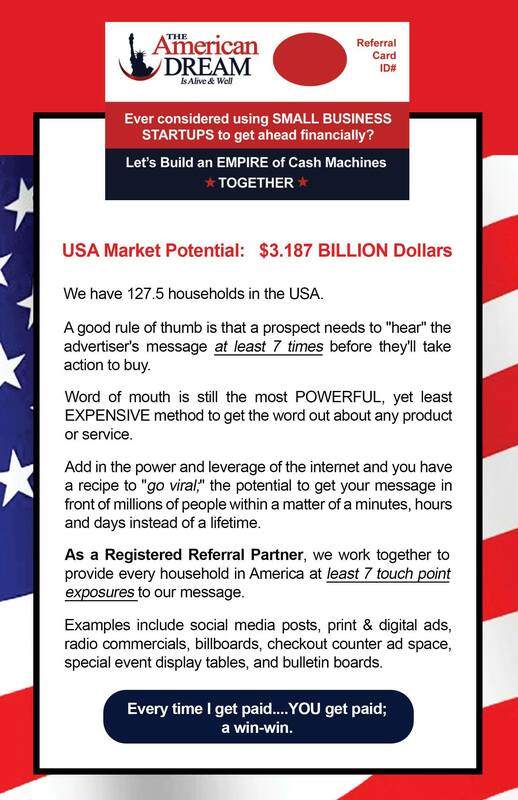 Every time this project generates a dollar, YOU could be getting a piece of the action. 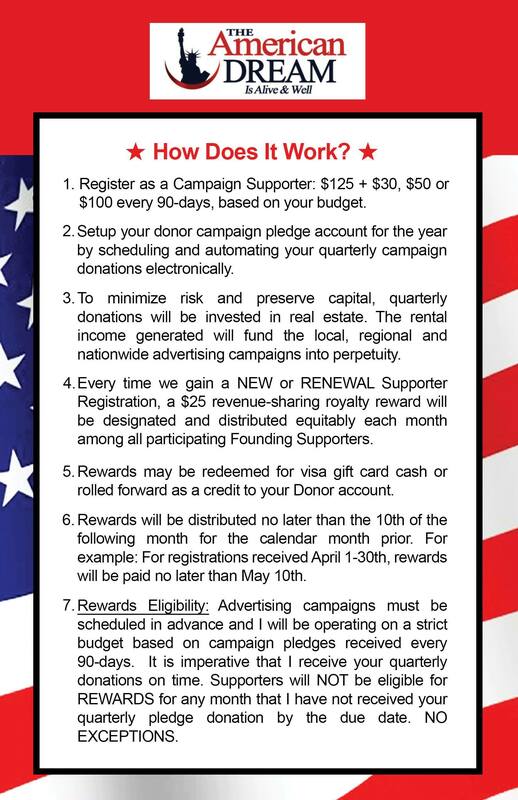 Month after month, year after year every Supporter in our campaign is rewarded for their contribution. Supporters choose between two types of rewards based on their level of participation; cash or guest privileges. Rewards are paid no later than the 10th of the following month. There can never be any guarantees of income expressed or implied. It is against the law for any business to state otherwise. Some of you may not be interested in becoming a Project Supporter but you DO see the magnificent financial potential and would like to participate in the Advertising COOP. Professional advertising campaigns are planned and scheduled 3 to 12-months in advance based on the level of COOP registrations received each month. We get the BEST rates when we purchase in bulk and have the BEST results when we have several campaigns going at once; which is called a "blitz." With that said, there are only 12-month COOP options available, NO pro-ratas. 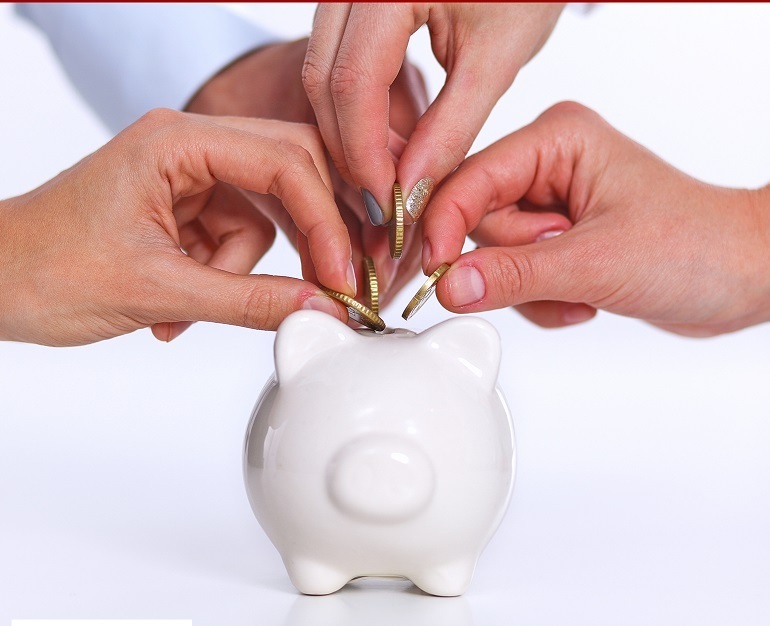 Revenue-sharing Royalty Rewards are calculated for each calendar month and distributed equitably among all COOP participants no later than the 10th of the following month. COOP Registration Rewards are $5 each. 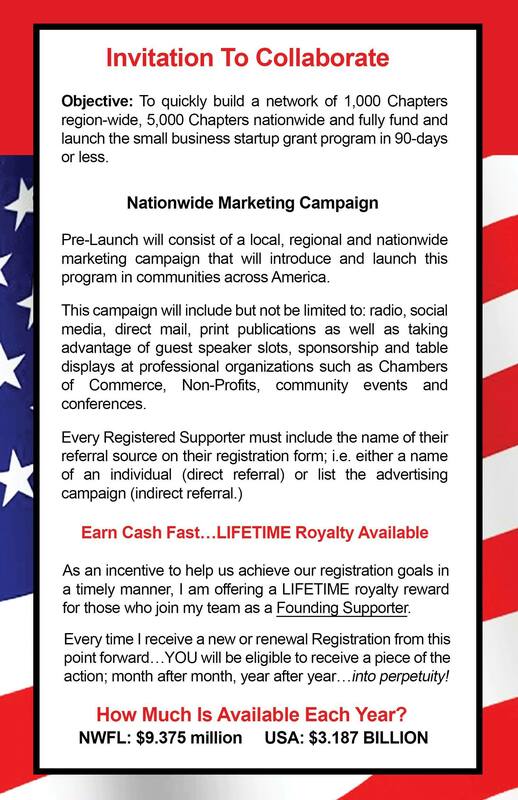 Direct Referrals (your name listed on ANY registration or tied to your affiliate link) will be paid WEEKLY. 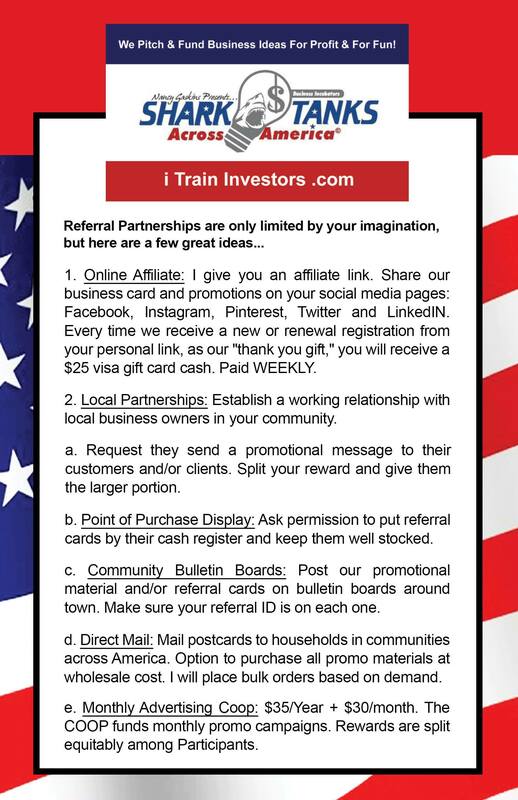 Upon receipt of your registration, I will email you an affiliate link and promotional material files authorized for your use; 4x6 double-sided full color Postcards, business cards, flyer and social media verbiage for any ads you may want to place. Due to the industry in which this business operates, it is highly regulated, therefore only AUTHORIZED promotional materials can be used. You have permission to print the files I provide or you can purchase them directly from me and enjoy high quality materials at wholesale pricing when I buy in bulk each month. 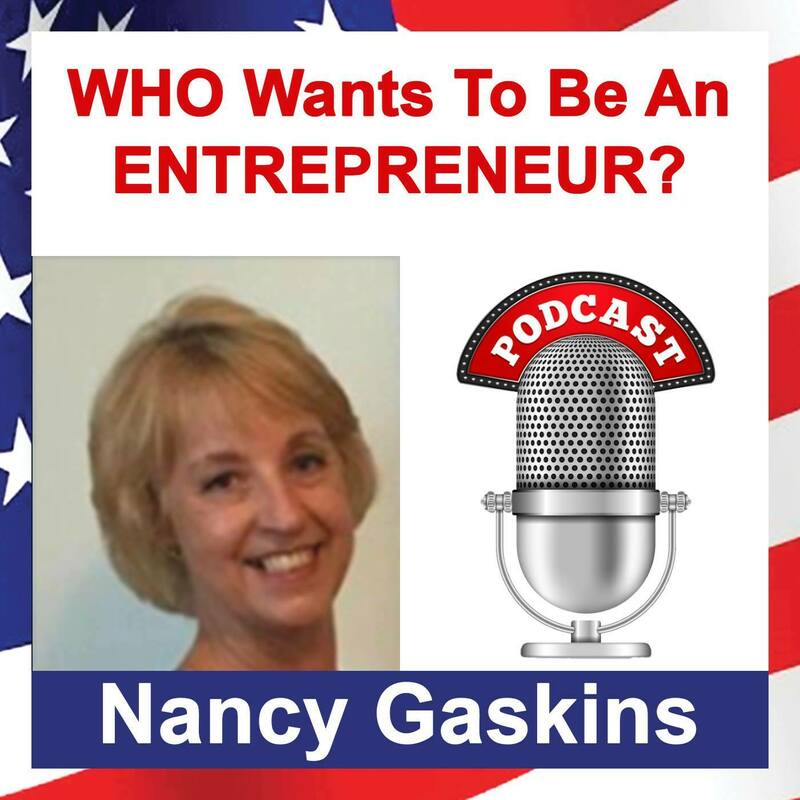 I'll be covering your most frequently asked questions regarding this program as well as other issues facing aspiring, emerging and seasoned entrepreneurs. you can use the info below to register. 3. Type $125 in as your dollar amount. 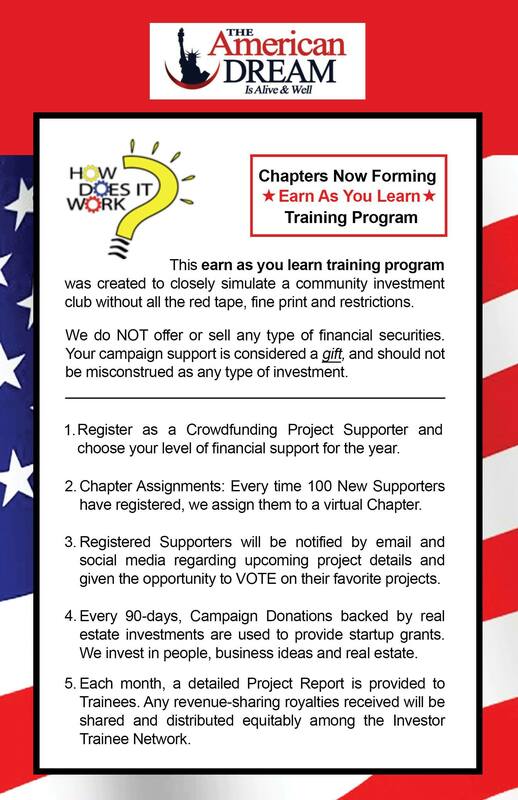 You will receive a confirmation upon receipt of your initial campaign donation. What's holding you back from living the life of your dreams? Let our panel of experts help you level UP every area of your life in 2019! 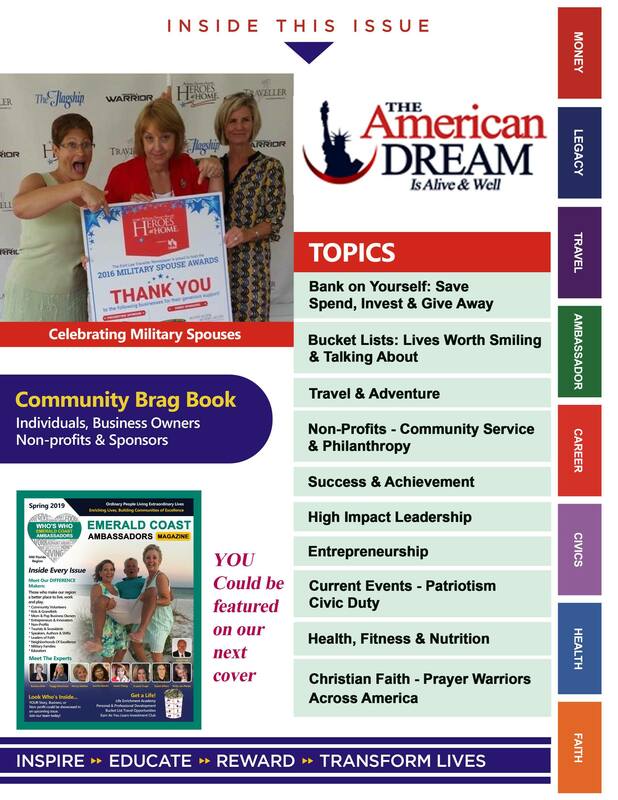 Improve your finances, relationships, health & fitness, career, launch a new business, build up your faith, join us for travel and adventures and knock off some of those items on your bucket list! 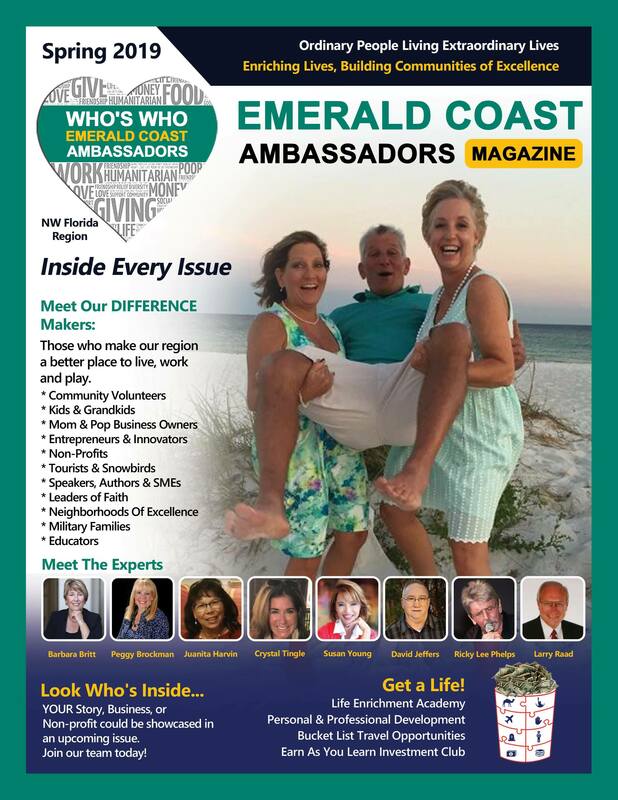 Emerald Coast Ambassadors is a new Life Enrichment Magazine filled with inspiration, tools and resources to help everyday families create, fund and live lives worth smiling and talking about! Local and Regional Chambers of Commerce. 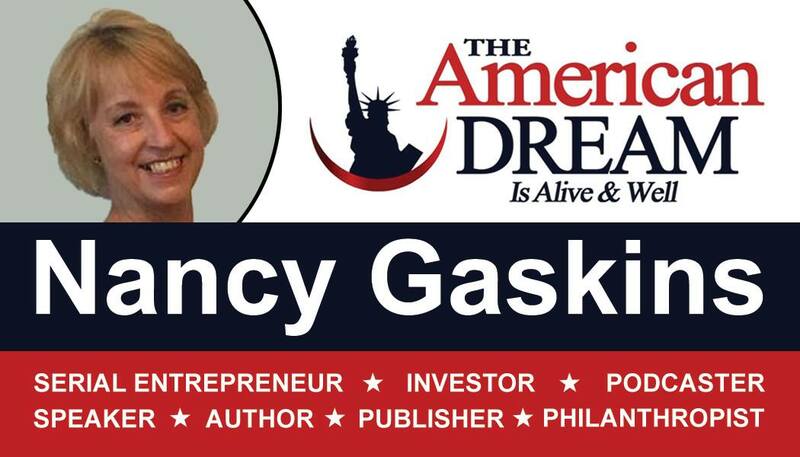 Nancy Gaskins. 2009-19. All rights reserved.